Rev Duncan Durward becomes the new young minister at the parish church at Langrashes, a harbour town on the east coast of Scotland. It is the late 19th century. Before this he had been assistant at St Anne's, Edinburgh. His "solid ability and true kindliness" made him "admirably fitted for his position", even if he annoys local spinsters by announcing his engagement to Helen Monteith, the governess to Sir James Armstrong's daughter, to whom Duncan had previously been tutor. Once he arrives, he finds that "drink is absolutery ruining the place" and, as "a man of a more robust mental type than his amiable predecessor", decides that "Strong measures must be taken .... for the daily sight of the starving, ill-clad wives and children down in the Seagate is really more than I can bear." He had always been "a good fellow - hardworking and earnest", but by the end of the book, "his troubles have vastly improved him, both as a man and a minister .... He is less over-bearing and more charitable than he was before misfortune came to himself" and is convinced that "even in this world truth must prevail over falshood, and right over wrong", as "a higher power controls human destinies". Any claim he has to be a detective is, it must be admitted, a slight one, but it is he who eventually finds a way of identifying the guilty party who has been plaguing him. Andrew Cheviot was the pen-name used by James Hiram Watson (1852-1903), a Border historian, who was best known as editor of Proverbs, Proverbial Expressions, and Popular Rhymes of Scotland. 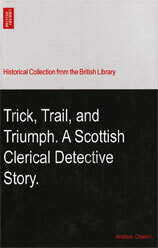 His other books included Black Agnes: a Romance of the Siege of Dunbar and The Provost of St Foins. He was the son of a Church of Scotland minister and became Probationer in charge of Cellardyke Chapel - but after a year resigned the ministry in 1883 and took up writing. He never married. Trick, Trial and Triumph. A Scottish Clerical Detective Story describes how the newly appointed young minister Rev Duncan Durward upsets Foxy, a local banker (who has 9 daughters to marry off), and ends by being accused by him of giving him a forged £20 note. Duncan, much helped by his patron Sir James Armstrong and Detective Inspector Spinks, sets about clearing his name - and even travels all the way to Canada in his effort to find the truth. 'Well, well, the least said the better,' the kindly doctor would answer with a sickly smile. 'Our Christian brother has many admirable qualities, and if you can get him persuaded to become an abstainer, have no doubt will make an excellent minister.' That was quite enough, the candidate's chances were ruined." But Durward, at least, was strictly teetotal and so impervious to attacks like these. His enemies had to find another way to get rid of him. And could the author have been speaking for himself when he gets Sir James to argue that hypocrites within the church are a disgrace and “a scandal to the cause of true religion”. “You like them even worse than the High Church party!” laughed Durward. “Oh, infinitely worse! Indeed there is no room for comparison. The silly lads who amuse themselves by playing with forms and ceremonies, decking their handsome persons in new and curious forms of ecclesiastical millinery,and weakly aping Episcopacy when they have the chance, are merely fools for their pains. They are little regarded, and cannot do serious harm. It is the canting, self-seeking hypocrite who is the real source of danger, destroying, as he does, the confidence of the people in the righteousness of the Church” warmly concluded the Baronet. 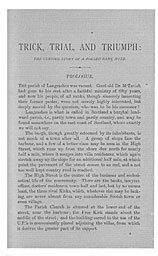 It is all written in a quiet gently humorous way that makes it surprisingly easy to read, despite the heavy Scots dialogue of some of the local characters, as when one of them explains, “Nae doubt it'll be a teuch fecht and a hard tuzzle" but you soon get the general sense of it. Only once does the author forget himself and allow "He saw him grasp the decanter, and, like a wise man, saved his head by jouking, and letting the jaw gae bye" slip into the actual narration. And the story gives a fascinating glimpse into life at the time. There is a hardly a mention of the author on the web. The book, originally published in 1891, has been reproduced in digitised form by the British Library and printed by amazon.co.uk. Unfortunately they not only got the title wrong (it should be Trial not Trail), but ended up with a dreary grey page background (see below) that is distinctly off-putting.